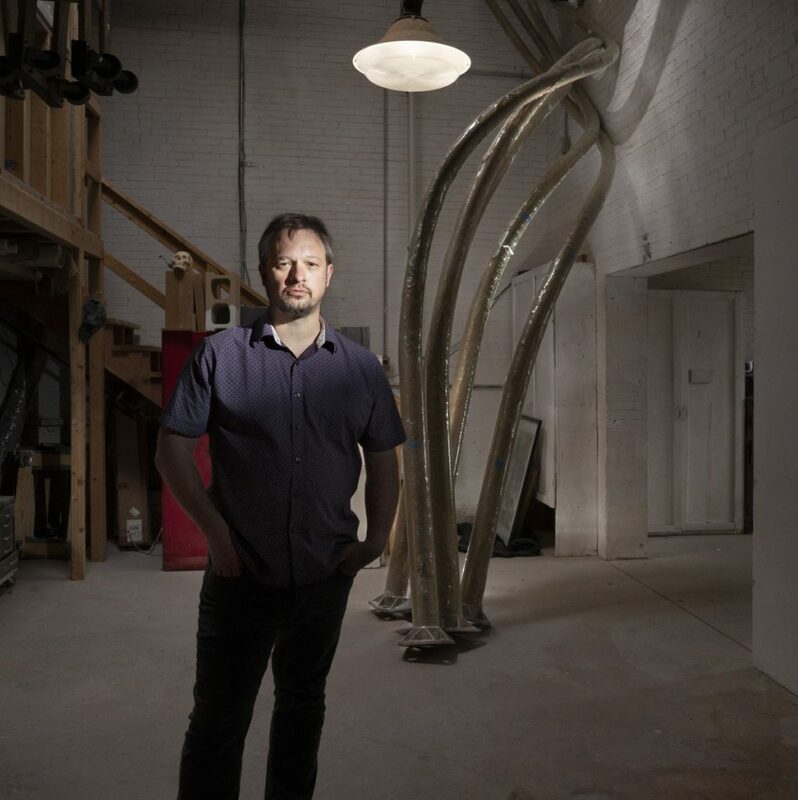 Five sleek poles, each 20 feet tall, twisted and meticulously wrapped in paper and plastic, stand in the corner of Aaron Stephan’s Portland studio, located less than a mile away from Woodfords Corner. The poles are part of Stephan’s latest public art project, which is now ready for the spotlight. 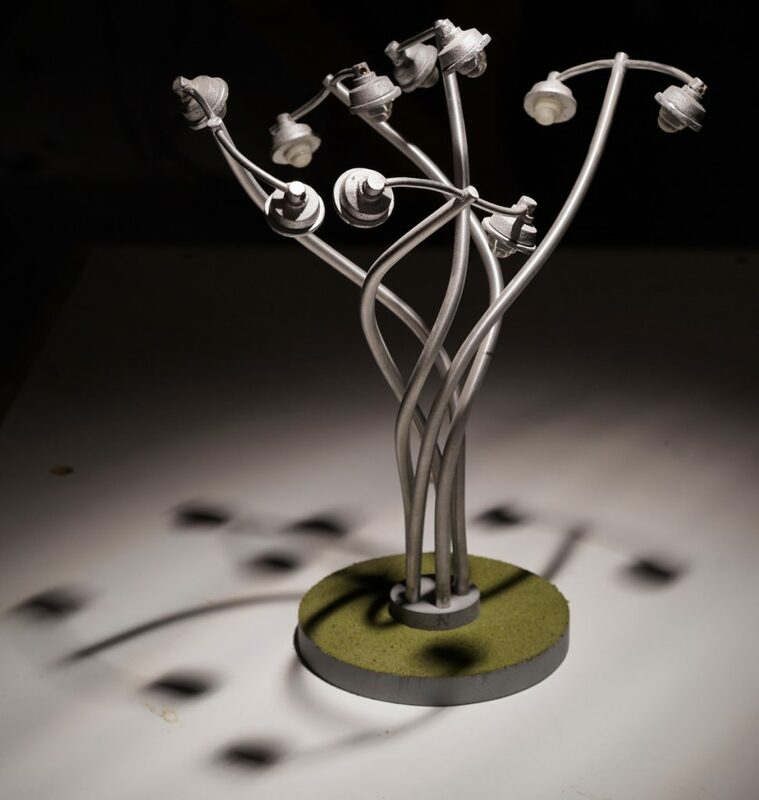 In the coming weeks, he will watch his “Luminous Arbor” sculpture get planted on a corner of the chaotic five-way intersection in Portland and take the form of a tree with two, dimly lit LED streetlights at the end of each branch. Though the poles will be tangled, much like the high-volume intersection, Stephan hopes the sculpture will have a different effect on the stressed-out drivers of the roughly 27,000 vehicles a day that pass through the intersection of Forest Avenue, Woodford Street and Deering Avenue, while also playing to the theme that intersections are connections – in this case, for people living in different neighborhoods. Stephan did similar street-lamp sculptures for the W.G. Mallett School in Farmington a few years ago, and a series of five of his lamp sculptures are on display at Texas Tech University. He hopes the Portland sculpture will be received more warmly than when it was unveiled two-and-a-half-years ago. But if everyone likes it, then on some level that would mean he didn’t do his job. “Luminous Arbor” is slated to be installed Oct. 22, according to the Maine Department of Transportation, which is overseeing the redesign of Woodfords Corner. It’s being placed in a new plaza being built in front of the historic Odd Fellows Hall, whose recently restored clock tower is the corner’s defining characteristic – other than the traffic, of course. The roughly $5 million infrastructure project, which got underway in August of last year, also includes realigning traffic lanes, adding bike lanes, new traffic signals and signs, improving a railroad crossing, widening sidewalks and intersection bump-outs so pedestrians can cross the street more safely, and planting streetlights. An additional $4 million in utility work on gas, water and sewer lines is simultaneously occurring. The city of Portland is investing $3.2 million into the project, which includes a $1.1 million sewer project. And “Luminous Arbor” was funded by a $25,000 allocation from the city’s Public Art Committee. Nearly $2.4 million in federal funds and nearly $558,000 in state funds are also being invested, according to Maine DOT. When the sculpture is installed, it will be a tangible sign that the more than yearlong project is wrapping up. Maine DOT spokesman Ted Talbot said crews are still aiming for the original Nov. 5 completion date, but that it will likely take until December to finish, since there were some delays associated with the utility work. And crews may still have to return later for the final paving work, he said. Last Wednesday morning, crews were busy smoothing out cement at the new plaza and others were paving a commercial driveway off Forest Avenue. The project cannot wrap up soon enough for business owners like Andrew Zarro, a co-owner of Little Woodfords coffee shop. Zarro and his husband opened their coffee shop at Woodfords Corner nearly a year ago. The first year is difficult for most new businesses, but Zarro said Little Woodfoods had the additional challenge of heavy construction, which caused the business to actually close its doors periodically – whether because of water issues, or having an open trench in front of their doorway, or a soggy sidewalk of wet cement. Though construction has been a yearlong headache, Zarro said he supports the changes and is eager to see the finished product, which will include new streetscapes with benches and trees. Zarro also serves on the board of the nonprofit Friends of Woodfords Corner. He said that group has just filed an application with the Maine Development Foundation’s Maine Downtown Center to become officially recognized as a “Main Street,” which would open the door for grant and foundation funding for continuing efforts to make Woodfords Corner a destination, rather than a speed bump along the way to someplace else. “It will be a village, as opposed to the gross hub filled with traffic,” Zarro said. As for the art? He’s excited for that, too.